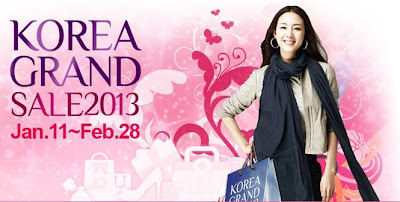 The Korea Grand Sale has returned for the 3rd year! A nationwide shopping extravaganza designed to help foreign tourists enjoy their Korean shopping experience, the Korea Grand Sale has returned this 2013. As overseas guests in Korea, you are eligible for special product discounts, free admission to leading attractions, and even free gifts! About 24,000 companies and organizations are participating, including your favorite brands. Make sure not to miss scheduled events, including Korea Grand Sale Kick-off at Myeongdong, special weekly events and more! Also, take advantage of services such as the K-Shuttle buses that will take you to hot spots in Korea and free shuttles through Seoul and Gyeonggi-do! Wow. A lot of us would really love this. Maybe we could follow each other on Bloglovin and/or GFC?